Woodworking is not an easy skill to learn. It takes years of practice and wasting of woods to be good at it. If you are a beginner woodworker you may feel overwhelm and stuck. 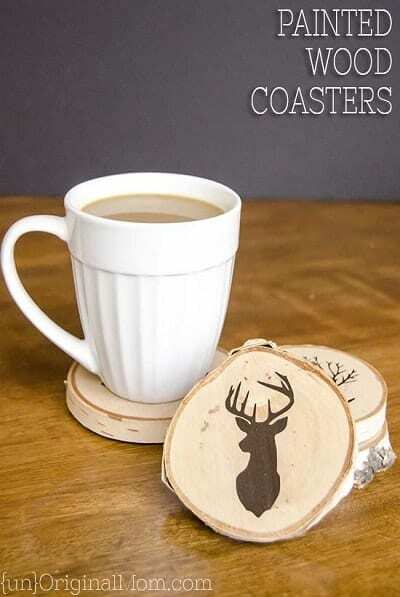 You won’t have to endure hours of torture trying to remove coffee rings from your tables once you have made these handy and attractive coasters. 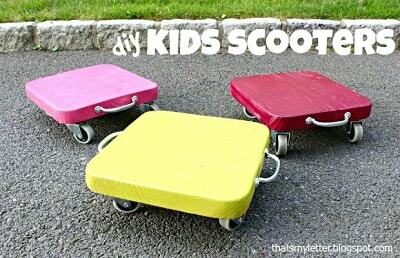 They’re an ideal project for those of you just starting out, and can be made with easy-to-find materials. Personalize them with any image of your choice. Start with something simple and work your way up! 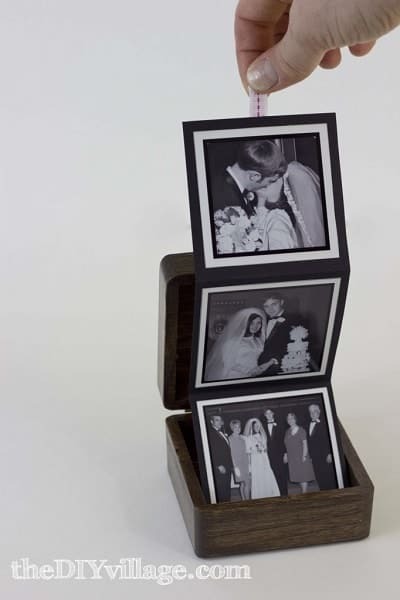 If you put some photos of your children into a small box such as this - especially if it is a box which you have made yourself - and gift it to your parents, there is no doubt that they will be the happiest grandma and grandpa on the planet! It’s something which will take you little time and effort, but will give your beloved seniors endless hours of pleasure. What could be simpler? Find a piece of nice wood, cut out a shape - and it really can be any shape - and you’ve got yourself a kitchen cutting board which Gordon Ramsay would be proud of! 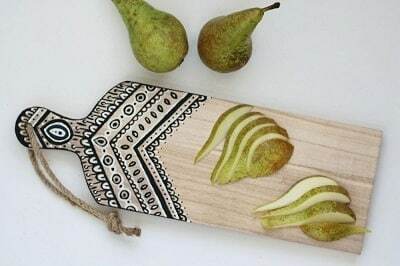 You can make it your own by painting onto it a pattern of your choice, but just be careful when selecting the paint as it will likely come into contact with food. How many people in your street have a homemade cutting board? Probably none, so get started and be the first! This one is sure to turn heads. We’re getting a little more complicated now, but it’s nothing you can’t handle. 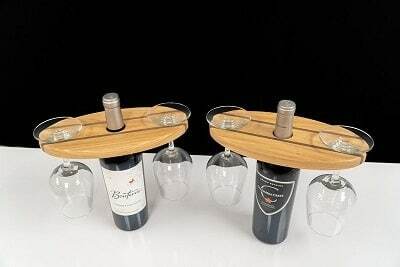 This wine holder makes an impressive gift, but it costs almost nothing to make. 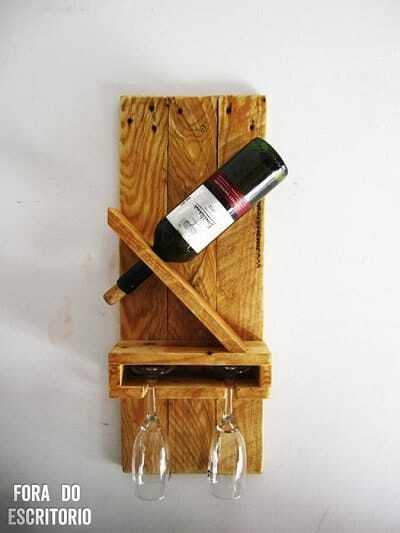 Any wood will do, but for that rustic look, I suggest some pallet wood which is perfectly easy to come by. Of course, if you like something more polished, source some better wood and set your sander, stain and varnish to work. To make these wooden coffee mugs, you are going to need some serious equipment, but the end result makes it worthwhile. You can use one piece of wood - if you can find something thick enough - or for a little color contrast, use two different pieces. Take care when choosing the protective resin for the inside; while it may be classed and labelled as food-safe, it may not be able to stand up to the high temperatures to which it will be subjected. If you make this serving tray quietly in the garage and then use it to take your loved one breakfast-in-bed once it’s completed, you may just get something a little extra special this Christmas! It’s very simple to make with the most technical part being a 45 degree miter cut, and it’s one of those rare woodworking projects which doesn’t have to be absolutely perfect. Yes, I know, it’s fair to say that the majority of people who do still read books do so online, but there are still some of us who enjoy reading the real thing. This great idea doubles as a book stand as well as a bookmark, and will preserve the spine of your book much better than a traditional one. If you decide to make this yourself, it presents a good opportunity in getting those angles cut to perfection. Do you sit at a desk all day long? Are you always fumbling around for a business card? Here’s the solution - a DIY business card holder which only takes an hour to make for those of you whom are proficient with a miter saw. You’ve probably gone to great lengths sourcing your cards on 450gsm card, laminated with gold leaf etc, so why not be the talk of the local business community and present them in a unique way? How did you get the holes for knives into this block of wood? That’s what people will be asking you if you make one of these simple knife blocks and spend some time finishing it to a high quality. Of course, you will know that it’s comprised of several blocks, but you can keep that little secret to yourself! This project is a good way to practice your router skills, and if you want to make it into a deluxe knife block, add an extra little piece at the bottom and you now have a recipe book stand too. 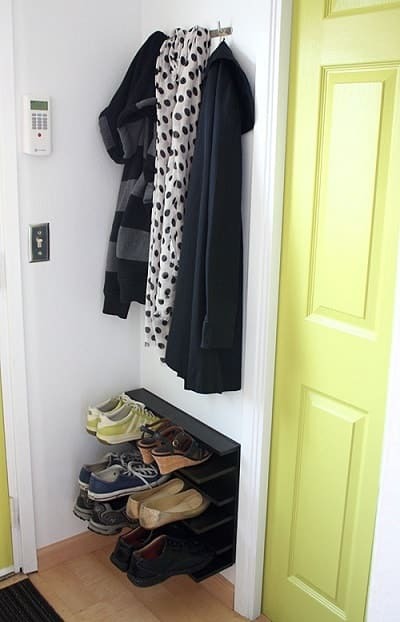 Coats can be bulky and take up a surprising amount of space. To make this wall-mounted coat hanger, all you need is some wood, glue, a few screws and, well, some wooden coat hangers! In a short space of time and with some basic woodworking skills, you will be able to keep your over-garments in their place. You know the greatest thing about having woodworking skills? You can save a whole lot of money! 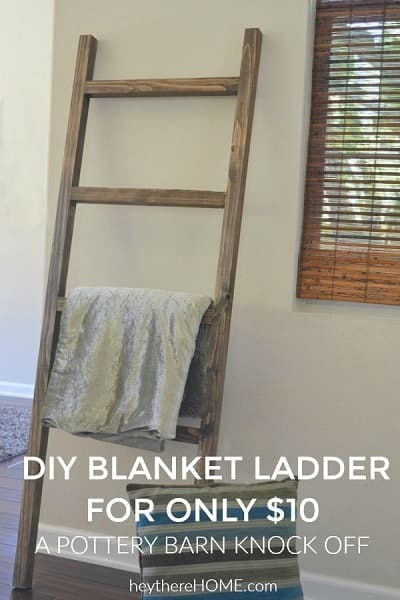 Something which costs several hundred dollars in the store can be made at home for an amount of dollars which can be counted on your fingers, and there is no better example than this blanket ladder. Blankets - and indeed towels - take up far too much room and it’s always a struggle to find somewhere to hang them all when they’re damp. So why not make one yourself and keep them all in one place? It’s a very simple project with which to occupy yourself over a weekend. We’ve covered the wall-mounted coat hanger, so why not make a shoe rack which can be hung directly below it? It’s something you will find to be a great space saver, and it will stop the kids from kicking off their footwear and leaving them anywhere which pleases them! To make it even more striking, use the same wood and stain and varnish it the same color as your coat hanger. Do you know anybody who does not own a smart phone? No, thought not! We use them for work, we play games on them, we check them for messages every five seconds, and we even sleep with them. We should therefore take better care of them. 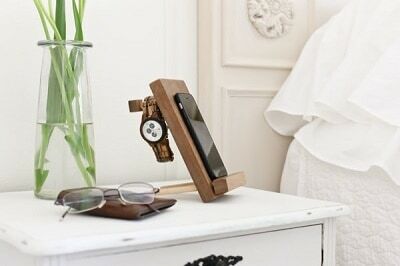 Stop throwing your phone down, causing scratches and dents over the course of time, and make this nice little phone stand. If you want to be really fancy, you could add a couple of extra little holes and thread your charging cable through. Every Home probably has a small bag of tealights stuffed into a drawer somewhere, why not use them? You can make a highly presentable holder for them starting with a single block moving up to a holder with multiple slots, which will look absolutely stunning on your dinner table the next time you are entertaining at home. Pennant wood banners are so very versatile. They can be used indoors as decoration, and also outside, not only as a decorative addition but to scare off the birds. Things don’t get any easier than making your own from wood. 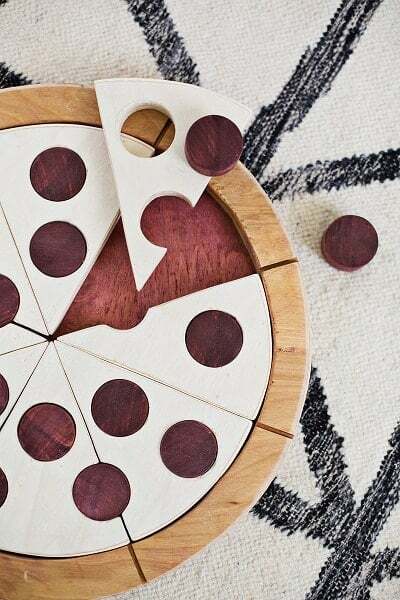 Cut triangles, drill a couple of holes, thread some string, add some patterns with paint, and you’re good to go! Have you ever considered the fact that you can make your own jewelry from wood? Well, you can! 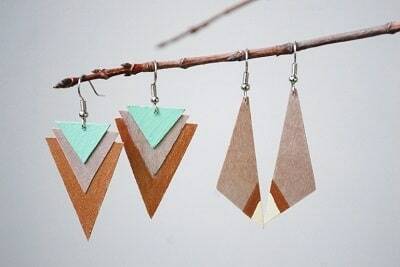 Look at these earrings made from 1/16 inch birch plywood. Stain them, varnish them, paint them, cut them into any shape and you already have your very own jewelry brand! They are so simple to make, and could easily provide you with some extra income by selling them on Ebay and other online shopping platforms. Back to lighting: if you’re brave enough to hang something from your ceiling, this hanging DIY chandelier will complement any room. It’s a little further up on the difficulty scale, but with a little patience, you can do it. So, retrieve those Mason Jars from the back of the cupboard and get to work. You will also need some basic electrical skills to get it all wired up, or ask a friend to help. Find an old piece of wood, anything will do as long as it’s flat - or almost flat - and you have the beginnings of a wonderful place to hang your jewelry, especially those earrings we talked about a little while ago. Custom make it so that you can place your bangles, bracelets, wristwatches and rings onto it. Staying on the subject of bangles and bracelets, how about making your own at home? Providing you have the right tools, you can make your own using your woodworking skills or buy plain ones very easily online. Once you have made or sourced them, create unique and personal patterns as well as staining them to a color which suits the skin tone or the recipient. This is a great idea for when BBQ season comes around again - DIY solar light holders. All you need are a few fence posts which can be picked up for pennies if you look in the right places, a good drill, your solar lights, and you’re ready! You have outside lighting that costs nothing whatsoever once you’ve got it up and running, and besides that, it looks terrific. 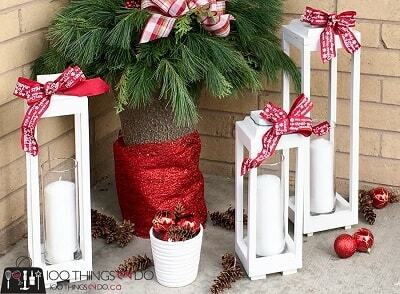 Here’s another outside lighting idea - lantern style candle holders. You can also make smaller versions to go on your dinner table, or even bedside table if you and your partner are in the mood for a little romance. They’re moderately easy to make, you don’t need expensive wood, and they can be painted and finished in any color to fit into their surroundings. This is one for her, whether she is a wife, sister, aunt or mum. There are endless ways in which you can present this jewelry box design. The frame can be painted or stained in one color, the drawers another, and you can choose your own knobs or handles accordingly. If you want to make it really personal, you could even consider branding the person’s name to whom you are gifting it. A picture or photograph says it all and provides us with fond and important memories. But, what’s a nice picture if it’s surrounded by a shabby frame? Here’s another simple-to-make idea, a DIY picture frame. Four pieces of wood accurately cut with 45 degree angles is all it takes, plus a bit of finishing and it will be a beautiful centerpiece on any wall. My work desk used to be a total nightmare, so I decided to make my own organizer, and since then the days of everything everywhere are long gone. 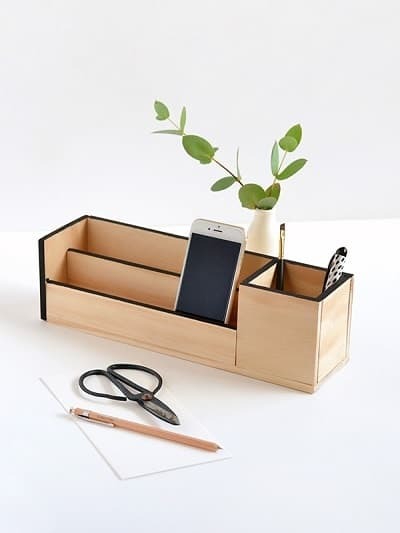 The great thing about this idea is that you can make it to any width, height and length you want, and add as many separate compartments as you need depending on what you use on a regular basis. 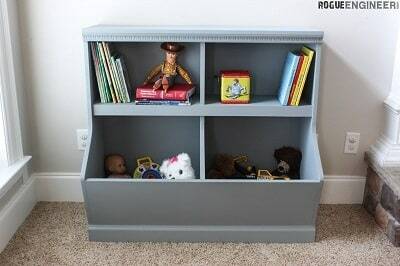 You can make this combined bookshelf and toy storage space, but doing so doesn’t mean that your little ones will actually put their books and toys inside it! The idea, however is a good one. You can paint it in your child’s favourite color, and jazz it up by adding some stickers of their favorite cartoon characters. 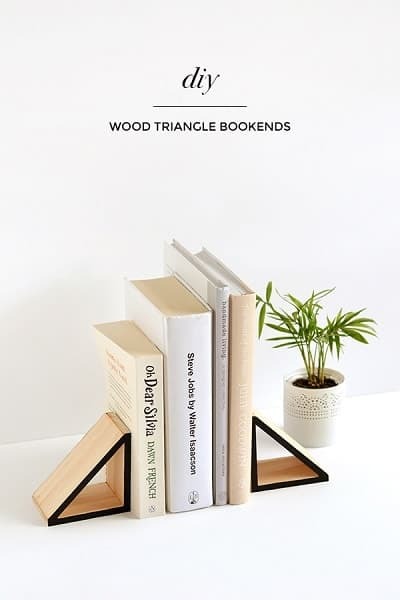 You don’t need to make a bookshelf from scratch; all you need are these handy bookends which will keep your reading collection neat and tidy. Again, it’s another nice small project which will test your angle cutting skills. Don’t forget to add a rubber pad onto the bottom to stop them from slipping away from their rightful place. This is another creation which looks great when made with cheap used pallet wood which can be picked up easily from places such as warehouses and supermarkets. The pallet may have seen better days, but there is usually a lot of life left in the wood itself. 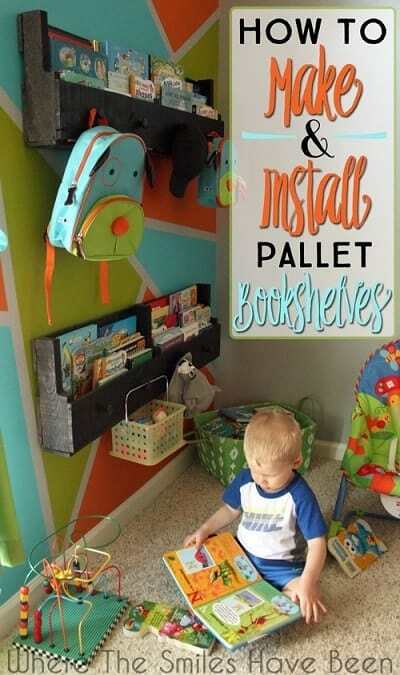 An additional idea for books is to make a wall-mounted bookshelf. They’re great in children’s bedrooms and also in the kitchen where you can store your recipe books. 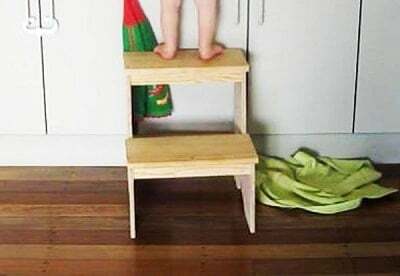 These step-stools are surprisingly easy to make and are an ideal gift for any members of your family or friends whom may live in a house with high ceilings, or are slightly vertically challenged. I advise you to put rubber strips on the bottom for safety reasons, you don’t want any slips or falls. Crayons, felt tip pens, pencils, they get everywhere and they sure can hurt if you step on them with bare feet. Keep them neat, tidy and in once place where everyone in the house can find them by making this pencil holder. It is not something which is going to be the center of attention and therefore doesn’t require an expensive cut of wood, meaning it will be very cheap to make. Be original and decorate it using some colorful paper, perhaps? There are three things which can be guaranteed in this world: death, taxes and the fact that everyone loves candy! 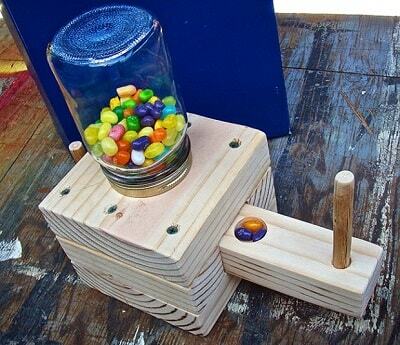 This candy dispenser is something which will make you a hit with not only the kids, but the adults as well. It’s going to be so popular that your budget for candy will need to be greater than the cost of actually building it! It’s somewhat more difficult to produce than most of the other suggestions we have made on this page, but you will be so popular that it will undoubtedly be worth it. If ornithology - or bird watching - is your thing, you should have something in your garden which will attract them. They say that once a bird has found a regular source of food, they will never forget. Indeed, some of them fly thousands of miles every year back to the same gardens over and over again. 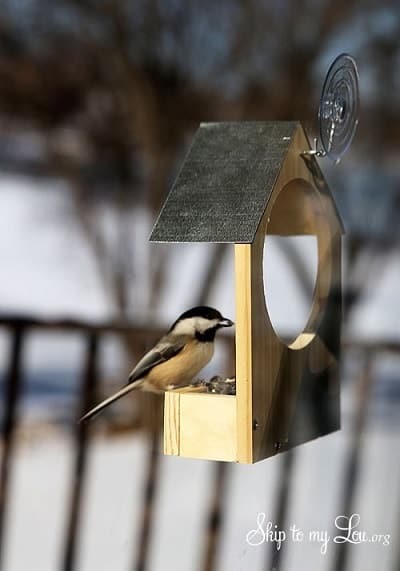 Make a few of these to hang onto your trees and even the outside of your windows using a suction pad so that you can get a real close up view. This is such an easy task, it can be made in well under an hour. 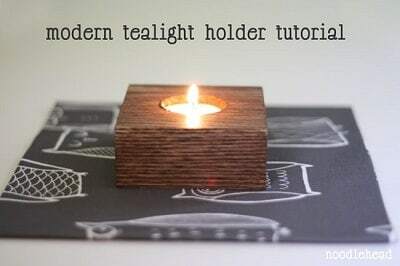 Balsa wood is not only good for making radio controlled planes, it can be a great for making candle holders too! Light and pliable, it’s probably one of the easiest materials for any woodworker to work with, and you can literally churn dozens of these out in a short space of time. Dip them in different colored paints to make them more attractive. Make sure your candle is in a glass holder or your balsa wood will be mere ashes in no time at all! To call this a toy bin is only a suggested name. It can be used to store almost anything at home. DVDs, books, magazines or it could even be used to display your prized ornaments. You can make the back so that it sits flush against the wall, or if you are feeling brave, make a different version which will fit perfectly into any corner of the room. Forget about those tacky whiteboards we have hanging around the house onto which we write our shopping and to do lists, this is much more interesting, classy and attractive. 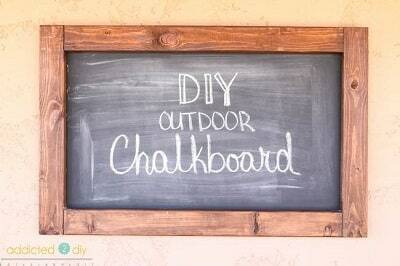 You don’t need to go out and spend a fortune on a piece of slate such as we used to write on in school years ago, you can easily get hold of some chalkboard paint which is just as good and looks the part. If you have young children who are at the age where they are starting to copy and mimic Mummy and Daddy, this toy camera is a first-rate idea. Your little ones can carry it around and click away until their hearts are content and their young imaginations are fed. Consider making it even more realistic by attaching a strap. 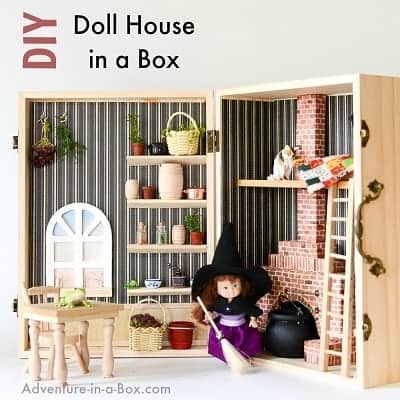 This dollhouse-in-a-box will make a seriously beautiful addition to any little girl’s bedroom. You can buy a plain box and go from there, or if you want full credit, make it yourself from scratch. Just about anything can be added to it such as a table and chairs, as well as an infinite choice of accessories. This item is one which costs little to make, but if you do a perfect job it will fetch a good amount of money at a craft fair. There’s some food for thought! If you have an old game of Jenga lying around anywhere which never gets used, don’t throw it away! You can use it to make some wooden blocks. At first glance, they look like ordinary blocks but they are far from ordinary. They have two sides using transparent glass meaning you can fill them with water, colored oil, sand, and they will keep the youngsters occupied for hours on end. We just gave a very brief mention to the internationally popular game, Jenga, so how about making your own puzzle? Here’s one you can call Pizza Puzzle. It’s a very simple concept, but the good thing about it is that when everyone gets bored playing with it - which they eventually will - you can make another one which is slightly more complicated than the previous version. Imagine your children’s faces this Christmas Day morning when they open their gifts and find out that they have something on wheels! The excitement it will bring is more than worth it considering the simplicity involved in making it. You literally need a piece of flat wood, four wheels and a few screws! After you’ve painted it up in bright colors, you’ll be the best mummy or daddy in the world! We’re back on the booze again! This unique idea allows you to deliver wine to your guest in a rather impressive way. Take this as just a guide; why not be inventive and design and make a square one which can hold four glasses? Remember, good presentation makes food and drink taste better! Hopefully you will find this helpful. Do you have any projects in mind? Share with us we will list your awesome projcts here.